In addition to using MagCloud to market their real estate business, a number of real estate agents have been using MagCloud as a sales tool. 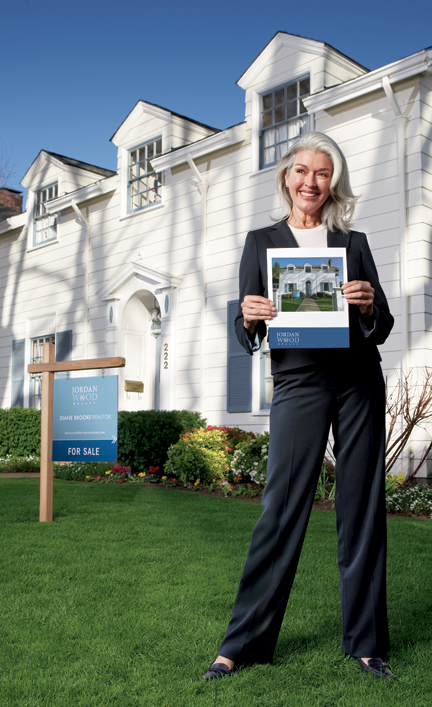 MagCloud’s print on demand capabilities allow real estate agents to order informational flyers for their open houses in smaller quantities, only as they need them, reducing waste and storage costs. Agents have taken advantage of MagCloud’s Ship to Group feature to easily mail copies of their listing catalog to an address list of potential buyers with a single order. The added benefit of MagCloud’s digital distribution means real estate agents can get these flyers and catalogs in front of potential buyers across all formats, whether it’s in print, as a downloadable PDF, or on the iPad. And if the price of a listing should change or photos need to be switched out, it’s as simple as uploading a new PDF file to immediately update both print and digital collateral. Beyond the traditional flyers and catalogs used as sales tools in the real estate industry, MagCloud’s combination of professional print quality and no minimum order volume offers real estate agents the opportunity to experiment with to market their listings without breaking their budget. For example, if you are trying to sell a condo with a breathtaking view you could give buyers the opportunity to see what the view looks like at different points during the day by creating a time-lapse photo flipbook using the MagCloud Digest Landscape product. By taking photos at regular intervals from the same spot over the course of the day, then placing one photo per page in a MagCloud publication, potential buyers attending an open house will be able to look at individual pages in the printed book to see how the view looks at different times during the day, or can flip through the booklet all at once to watch the view change over time. Highlighting a key feature like this can be a great sales tool, and using MagCloud will allow the piece to be professional and affordable even if you just a need a couple of copies. Alternatively, let’s say you have a listing for a single-family home in a neighborhood that has a lot to offer in terms of amenities. You could expand on the usual informational flyer and create a more in-depth, full color brochure with MagCloud that shows off not only the property, but shops, parks, restaurants, and schools in the surrounding area. Highlighting the key features outside the home that might appeal to your ideal buyer could be the difference that makes your listing stand out over the alternatives. Presenting this information as a high quality printed piece will have the added benefit of offering a more professional look without the expense of a traditional print run. If you have multiple target buyers for a single property you could even take it a step further and create different versions of the brochure to highlight the amenities that appeal to your different audiences. For example, one version of the brochure might give more emphasis to the great schools and parks in the area, while the other might highlight the local restaurants, public transportation and nearby fitness centers. With MagCloud, printing 25 copies each of two different brochures will cost the same amount as printing 50 copies of the same brochure, so with no added cost you can align the messaging on your sales materials to a particular buyer’s interests and help them more readily see themselves in the property, which could translate into a sale for you. MagCloud Real Estate Catalog Template: Catalog template created using the MagCloud specs for use with Microsoft Publisher. You can download the template here. 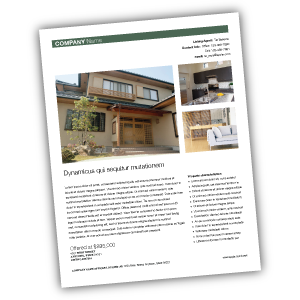 Microsoft Office Templates: The Microsoft Office website has a number of real estate templates that can be used with Word and Publisher, like this real estate flyer template for Microsoft Publisher. This template will allow you to create an 8.5 x 11″ PDF, perfect for printing with MagCloud’s Flyer product type. LayoutReady: LayoutReady has templates for Microsoft Word and Publisher, and offer a variety of options for real estate publications. Their 2-page letter-sized newsletter templates can be used with the MagCloud Flyer product type, and their 8.5″ x 11″ flyer templates can as well. Their 17″ x 11″ brochure templates will require some editing to convert them to 4 page 8.5 x 11″ PDFs, but after doing so they can be printed as 4-page MagCloud Standard publications. StockLayouts: StockLayouts has templates for Adobe InDesign, QuarkXPress, iWork Pages, Microsoft Word and Microsoft Publisher. Like LayoutReady, their 8.5 x 11″ flyer templates can be used with the MagCloud Flyer product type, while their 17″ x 11″ brochure templates and 11″ x 8.5″ newsletter templates will require some editing to convert them to 4 page 8.5 x11″ and 5.5 x8.5″ PDFs, respectively, but after doing so they can be printed as 4-page MagCloud Standard and Digest publications. Inkd: Inkd has templates for a wide variety of design software, and has a section of templates specific to the real estate industry. 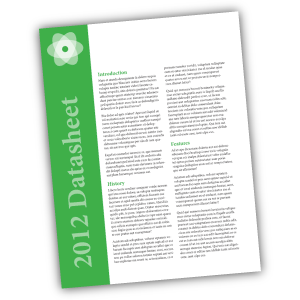 Their 8.5 x 11″ datasheet and flyer templates work great with the MagCloud Flyer product. Are you a real estate agent that has used MagCloud as a sales tool for your business? Let us know how you’ve been using it in the comments section below. One of the new product types we recently announced is the Flyer. The Flyer product is a single sheet of paper printed on both sides in full color with a full bleed, available in quantities of 10 copies or more. You can create a Flyer by uploading a one or two-page 8.5” x 11” PDF to MagCloud. Keep in mind that all Flyers must be two pages long, to encompass both the front and back sides of the printed sheet, so if you do upload a 1 page PDF we will automatically add a second blank page to the end of the PDF for you. Like our Standard product, the cost for a printed Flyer is 20 cents per MagCloud page, or $0.40 for each double-sided piece. As always, orders of 20 copies or more receive a bulk discount of 25%, dropping the price to just $0.30 per Flyer. 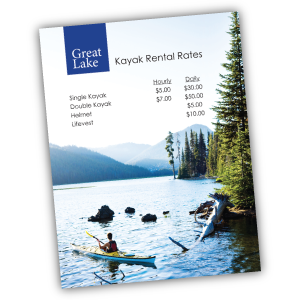 Update previously printed collateral to be more timely and customized by adding a single sheet insert. 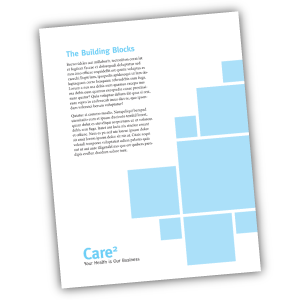 Adding a single sheet insert to a previously printed piece like this can provide more relevant information targeted to a specific recipient, or offer an update to existing collateral. For example, if you’re passing out a catalog, you might include an insert about your upcoming product line or summer sale. Similarly, if you are sending previous donors a copy of your non-profit’s annual prospectus, you might include a more personal thank you letter as an insert. Whether they are included in the conference materials or handed out at a tradeshow booth, providing printed handouts to attendees to highlight the features of your product or service will help potential customers remember who you are when they get home. The Flyer product is a great option for creating single sheets of technical specs on your product or service. The high quality of the digital printing provides a more professional appearance than desktop printing, while the single letter-sized sheet is a format that can easily be included in a packet with other materials, or left behind at a sales meeting. If you’re an Australian real estate agent, why not use the Flyer product to create sales sheets for your newly listed homes. The full color printing will allow you to include photos along with background information about the listing, that can be offered up as a way to entice potential buyers. Since MagCloud allows for shorter print runs, you can order fewer copies initially and print more on demand as they are needed, saving on storage and paper waste. 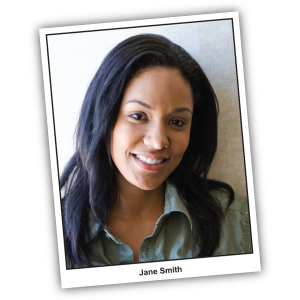 Get your job interview or audition off on the right foot with a professionally printed resume or double-sided headshot. Use the Flyer product type to communicate with your clients or members by creating a single-sheet newsletter. 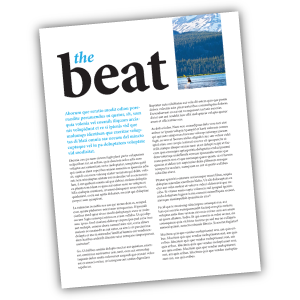 With MagCloud’s digital options, you can offer your audience the same newsletter in both print and digital with a single PDF upload. A single 8.5″ x 11″ sheet is the great size for menus, and MagCloud’s print-on-demand model provides a cost-effective and easy way to order additional copies or make updates to the menu as needed. If you’re a caterer, you can take advantage of MagCloud’s shorter print runs to create Flyer-sized menus tailored to each event you cater, whether it’s an intimate dinner party or a large buffet. Are you a photographer offering senior portrait packages? How about a sporting goods store offering bikes, kayaks, and skis for rent? Or a spa owner with a list of services you need to publicize? Whether you are a makeup artist, landscaper, tutor, or dog walker, let your potential customers know the rates for your services with a professionally printed price sheet that can incorporate full-color images of your prior work and personal branding. Use the Flyer product for what it was named after: flyers! Print and pass out single sheet flyers for your next retail sale, store opening, or company event. 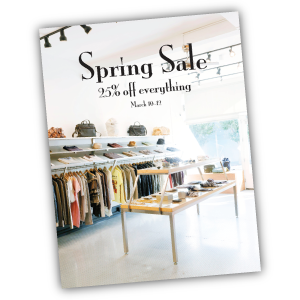 Whether you are hosting a signing in your book store, a concert in your coffee shop, or a spring sale in your clothing boutique, make sure your potential attendees and customers not only know about it but remember it with a printed flyer. Looking for more inspiration, or wondering where to get started with your Flyer design? Templates that fit the 8.5″ x 11″ Flyer product type can be found around the internet, and even on your own computer. The Microsoft Office Suite, as well as Apple’s iWorks Pages come preloaded with a number of letter-sized templates that can be used for creating Flyer publications. In addition, sites like Inkd and Stock Layouts offer a range of different letter-sized templates in their Datasheet and Flyer sections that you can download for a price and edit to fit your needs before uploading to the MagCloud site for printing and distribution. Have you already created something for your business with the new Flyer product? Let us know in the comments below!